Carbon is the energy currency of most biological systems, including agricultural ecosystems. All agricultural production originates from the process of plant photosynthesis, which uses sunshine to combine carbon dioxide (CO2) from the air with water and minerals from the soil to produce plant material, both above and below ground. There is no other human-managed realm with this potential. Common agricultural practices, including driving a tractor, tilling the soil, grazing, result in the return of C02 to the air. However, all farming is “carbon farming” because all agricultural production depends upon plant photosynthesis to move carbon dioxide out of the atmosphere and into the plant, where it is transformed into agricultural projects, whether food, flora, fuel or fiber. 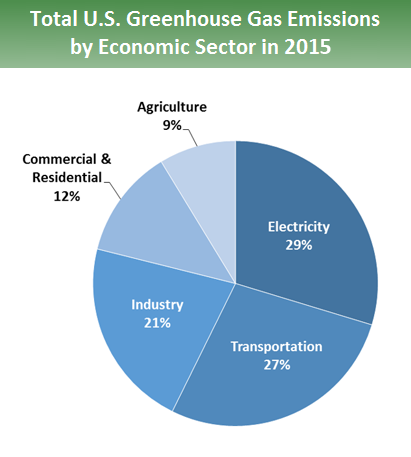 Agriculture only contributes 9% of the carbon dioxide emissions in the US.1 Agriculture, particularly grassland/rangelands, have a great potential to function as a sponge for carbon dioxide from our atmosphere. The maximum capacity of soil to store organic carbon is determined by soil type (% clay). However, management practices, implemented to maximize plant growth and minimize losses of organic carbon from soil, will result in greatest organic carbon storage in soil. Keeping working lands “working” can result in carbon stored long term (decades to centuries or more) beneficially in soils in a process called soil carbon sequestration; long-term carbon storage (decades to centuries or more) in soils. Rangelands: There are 23 million hectares of rangeland in California alone, and it is the largest land type on our planet today. Management of rangelands, through grazing, can lead to increased forage production, longer growing season and a potential conversion to a perennial system. Implementation of practices can meet both ranch goals while increasing the carbon sequestration on rangelands. Grazing stimulates plant growth through a variety of mechanisms, resulting in increased carbon capture by the grazed ecosystem. The potential to increase the amount of carbon held in rangeland ecosystems or to minimize losses of existing carbon offer landowners an opportunity to manage their lands in ways that contribute to climate change mitigation by encouraging carbon sequestration. This can be done by increasing carbon inputs and uptake, decreasing or preventing carbon releases, or both. How to increase carbon stored: A practice, known as “Carbon Farming” involves implementing practices that are known to improve the rate at which CO2 is removed from the atmosphere and converted to plant material and/or soil organic matter. Carbon farming is successful when carbon gains resulting from enhanced land management and/or conservation practices exceed carbon losses. Management practices that increase the amount of photosynthetically-captured carbon held, or “sequestered”, in long-term carbon pools on the farm or ranch, include soil organic matter, perennial plant roots and standing woody biomass. This results in a direct reduction in the amount of carbon dioxide in the atmosphere. Loren Poncia, Stemple Creek Ranch, has implemented a carbon farming plan to not only sequester carbon but enhance the quality and quality of his forage. Loren owns a grass based beef operation, and his animals are born, raised and finished on grass. He needs to supply adequate nutrition for his cattle have proper growth to his meet market goals. As part of his carbon plan, Loren implemented a grazing management plan, to promote perennial grasses growth. Perennials have deeper root systems, and will store more carbon, deeper in the soil. 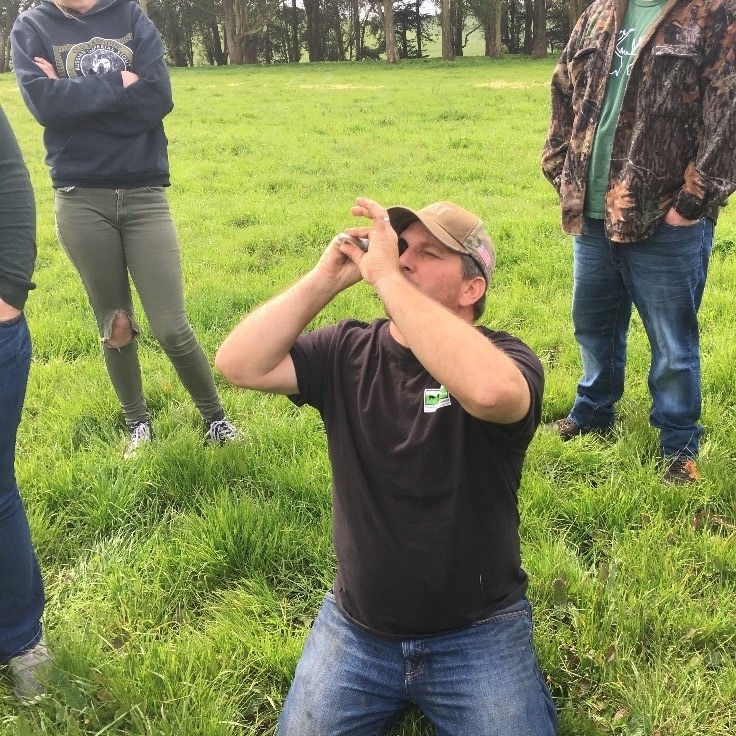 Loren checks the quality of his forage using a spectrometer, measuring sugar levels in the grasses, (Figure 1). Expanding Carbon Markets: There is a growing body of work suggesting that significant amounts of carbon can be stored in soil. This is particularly true on rangeland, which houses approximately 30 percent of terrestrial carbon stocks in addition to a substantial amount of aboveground carbon in trees, plants and grasses, and can hold carbon over longer periods of time.2 Expanding investment in programs, such as Carbon Farming and the Healthy Soils Program, can support agricultural practices that add to these stocks, creating potential markets to pay ranchers for sequestering carbon.3 Moreover, given the well-established relationship between soil organic matter (of which an average of 50 - 56% is carbon) and the ability of soils to retain water,4 such a market could contribute to watershed function, natural groundwater recharge and overall water provision. The scientific consensus surrounding the relation between greenhouse gas (GHG) emissions and global climate change has indicated a clear need for the US to find new ways to reduce emissions of these gases and the concentrations in the atmosphere to avoid significant and potentially catastrophic environmental changes. Land management for carbon sequestration is one of many opportunities available to the US, more locally in California, to reduce their net emissions of GHGs, particularly CO2. Carbon-oriented management of rangelands may offer landowners the opportunity to obtain a new source of income while simultaneously helping to mitigate climate change. The payment for ecosystem services, such as carbon sequestration, may be a potential solution to climate change. 2 FAO, 2009; Flynn, A., et al., 2009; White, R., et al., 2000. 3 De Gryze, S., et al., 2009. 4 Huntington, 2007; Pribyl, 2010; Rawls et al., 2003.